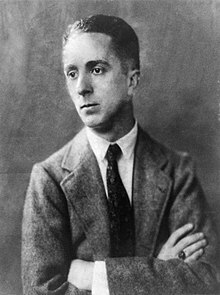 Norman Rockwell (February 3, 1894 - November 8, 1978) was an American painter. He was born in New York City. During 40 years Rockwell drew the cover pages of The Saturday Evening Post. He died of emphysema in Stockbridge, Massachusetts. The Norman Rockwell Museum in Stockbridge owns much of his work. Well known are his paintings on the Four Freedoms of President Franklin D. Roosevelt, called: Freedom of Speech, Freedom of Worship, Freedom from Want and Freedom from Fear. ↑ "Norman Rockwell". Biography. Retrieved October 8, 2017. ↑ "Four Freedoms". The National Archives. Retrieved October 8, 2017. This page was last changed on 7 March 2018, at 15:07.